Rivendell’s London based carers provide support for a range of conditions. From minor injuries to more long-term care – Rivendell can help you. We understand what is important to our clients and endeavour to provide the same carers to our clients on a regular basis. Our carers are trained to be flexible and knowledgeable about different conditions, this enables them to cater to our client’s requirements. Our in-depth care assessments allow a greater understanding of needs by finding out daily routines, medical history, religious/cultural beliefs, what you would like to gain out of the support and much more. Our aim is to provide a top quality level of care that you are completely comfortable and happy with. We get in contact with our team member’s last employers to ensure they are reliable, trustworthy, hardworking and of good character. Our care team are experienced in caring in both professional and personal capacities. Our staff have a varied experience of working in nursing and other care proffessions. We hold a large insurance policy. 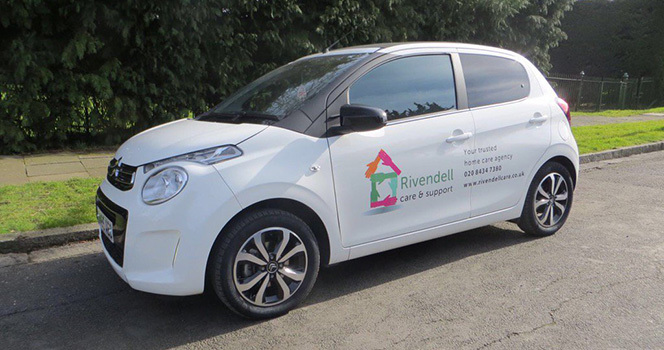 Rivendell Care & Support hold insurance which covers £10m Employers Liability and £10m Public Liability. We have a double stage face to face interview where we conduct scenario based questioning, questions relating to skill, theory based questions and questions relating to ensuring the carer is of good character. WE LOVE CARING FOR PEOPLE! Our care team have been employed because we believe they can help brighten our client’s days. Each carer has been through the “grandpa test”. Would I let this carer care for a family member? Dusting and vacuuming, cleaning the property, changing the bed linen and towels, laundry and ironing, cleaning floors and other housekeeping duties. Our London based home care agency offers visiting hourly care and live-in care services covering North West London. Our staff are well trained, accredited, vetted and love the job they do. We can provide Elderly Care, Dementia/Alzheimers Care, Rehabilitation Care, Palliative Care, Disability Care, Injury Care, Renablement Care and Learning Disability Care. Call us or send us an email and we can answer any of your questions and provide advice. We will conduct a free tailor-made care assessment outlining care needs. We will introduce carers which are matched according to care experience and personality. Barnet, Bushey, Chelsea, East Barnet, Edgware, Enfield, Finchley, Finchley Road, Garden Suburb, Golders Green,Hadley Wood, Hatfield, Hendon, Hertford, Hertfordshire, High Barnet,Kensington, Maida Vale, Mayfair, Mill Hill, Paddington, Stanmore, St Johns Wood, Temple Fortune, Ware, Welwyn Garden City, Wembley, Whetstone and Westminster. *Care from £13.50 within the Borough of Barnet when booking at least 5 hours per week.